As is often the case, Mazda rides to the rescue with a pair of great SUV's, the compact CX-5 and, the subject of this rant, the even more compact CX-3. You can get into a CX-3 for as little as $19,995 CAD and while you don't get a lot of toys or creature comforts for that amount of coinage, or even all wheel drive, you do get everything you really need – and it's augmented by a real, honest-to-goodness manual transmission. I drove that model late last year and, as I usually do with Mazdas, I loved it. But what if you don't want to shift for yourself (Heck, a manual these days is nearly as much of a theft deterrent as it is a transmission of choice) and you want the extra security and serenity of all wheel drive? And maybe a few toys? Well, other than stepping up to the CX-5, you could just choose a higher trim level of CX-3 (assuming you don't need the extra capacities of the CX-5). And that's what I did for a week, thanks to Mazda Canada's loaded CX-3 GT sample. The top line unit comes in at $30,995 CAD, which is considered quite affordable these days. Compare that to the top line CX-5, which will run you about $39,000, and the CX-3 becomes even more compelling – though of course there are plenty of reasons to justify the larger vehicle's still-reasonable (compared to the competition) price. The CX-3's heart is a two litre, non-turbo inline four-cylinder engine that puts out 146 horsepower @ 6,000 rpm and an identical 146 lb.-ft. of torque @ 2,800 rpm. This is power that obviously won't set the world on fire, but it's reasonably sufficient here. Sure, I wish they'd offer the CX-5's bigger engine, the 2.5 litre four with its 187/186 hp/torque but, considering the vehicles' comparative weights (the CX-5 is about 300 kilos heavier), you aren't really losing much, if anything. The power in this version gets to all four wheels via a six-speed automatic transmission. It works fine in normal mode, but if you put the CX-3 into Sport mode it seems to expect some spirited driving on your part and if you don't, it tends to hang onto gears as if it's saying "Come on, don't be such a wuss!" The solution? Driving more aggressively! Hey, they don't say "Zoom-Zoom" for nothing! Another solution is to use manual mode, which is pretty good here and which comes on the GT trim with shift paddles behind the steering wheel. I mentioned in my review of the manual CX-3 that driving it feels kind of like you're in a tall Mazda3, and that's high praise. You can say the same about the automatic version, of course, since it's the same vehicle – so what you're getting is a tall and practical vehicle that drives like one of the most interesting sedans you can get for less than forty grand. How bad can that be? Well, naturally it isn't perfect, but any quibbles I had wouldn't rise to the level of being a deal breaker. New for 2018, the CX-3 gets Mazda's G-Vectoring Control (GVC) and the company says it also features lower levels of noise/vibration/harshness (NVH), better ride comfort, a new steering wheel and better meters with higher contrast and wider viewing angles. I like narrower viewing angles so my wife can't see how fast I'm driving, but what can you do? Depending on the trim level you choose, the 2018 CX-3 will also give you new stuff such as the manual transmission (only on the base unit, alas), Smart City Brake Support (SCBS), Advanced Blind Spot Monitoring (ABSM), Rear Cross Traffic Alert (RCTA), a heated steering wheel, automatic HVAC, and a variety of the driving aids that are appearing across the industry – stuff like adaptive cruise control, lane departure warning, etc. etc. etc. You can also get LED headlights, a power driver's seat with memory and lots more. Mazda's top line sample sported a head's up display, projected via a flimsy-looking plastic flip up panel and it also featured traffic sign recognition that lets you know (usually) things like the speed limit you're currently ignoring and where vehicles are around you (basically the blind spot sensors repeated on the HUD). The CX-3 is a handsome vehicle, though I think the CX-5 has a more attractive bum, and it also features an interior that looks more upscale than it has any right to at this price point (which is also typically Mazda). Everything inside is mounted where it should be, though some might quibble with the console-mounting of the audio system's volume control and the LCD controller. I think they're just fine where they are – and if you're in the driver's seat you can access a lot of stuff via the steering wheel controls anyway. The rear seat is a tad tight if you're putting grownups back there, unless they're Munchkins, but it's okay for two. Fold down the seat and you add plenty of storage space, though if hauling ability is your number one reason for going SUV you might be served better elsewhere (the CX-5, perhaps?). My only real complaint about the CX-3 is its infotainment system. I liked it when it was new, but it's no longer one of my favourites, and that's because of all the menu scrolling you have to do. Fortunately, menu scrolling is something you don't usually have to do all the time, especially while driving. The biggest complaint I have about the interface, however, is that it's very slow, both in firing up and in action. I had the same complaint about the new Mazda 6 turbo, and I could live with it in either vehicle because there are so many other things to love about Mazdas. That said, there are better interfaces out there. My wife has informed me that our next vehicle will be an SUV with an automatic transmission (et tu, Beauté?) because she wants something taller than our low-slung sports wagon and is tired of shifting. I'd love to use that as an excuse for a Macan, but the Lotto Gods would have to smile on me a heckuva lot more than they have to date. That means we'll be looking for a more mainstream and entry level model. 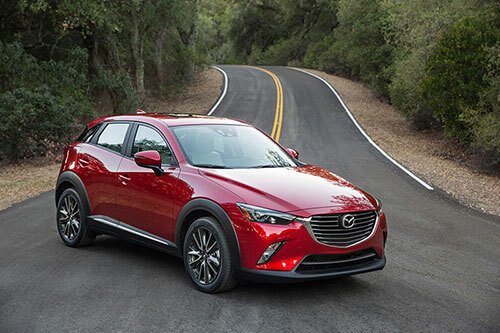 The Mazda CX-3 would fit the bill perfectly and, while I'd lose my beloved stick shift thanks to my dear lady's edict, I'd definitely not lose the fun to drive factor that I love. It may be a cliché by now, but it's difficult to argue that "Zoom-Zoom" is nothing more than marketing hype. It exists, and it seems built right into the DNA of nearly every Mazda I've driven, whether it's a Miata, a sedan, or an SUV.